All the essentials ready to load into the Van! We have an annual “boys trip” with four guys. Each gent gets a turn on his pic of the location and went it came to Greg’s turn he didn’t hesitate with the words Iceland. A week to ten days in Iceland around their famous "Ring Road" is one of the most iconic road trips available to any traveler. Iceland is a place of wonder and awe and its people, food, and culture make it even more amazing. This was the first sign I saw in Iceland...I mean come on it's gotta be a great place right?!?! Over the course of the next few months I’ll be giving a play by play of each day of this iconic road trip around Iceland's now becoming world famous Ring Road! We went in “shoulder season” leaving the States over Labor Day Weekend and it really cut down on the crowds. 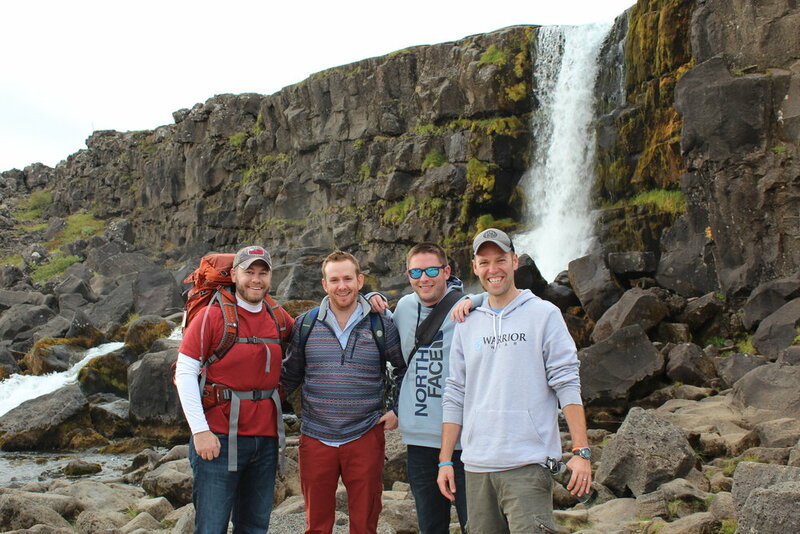 It also led to some crazy weather :), we experienced all four seasons in our 9 days in Iceland! First off let’s clear the air. Iceland is easy to get to from America and Europe. It was a quick flight from Columbus Ohio to NYC and then we had an overnight flight that was about 5.5 hours to land in Reykjavik. There’s this myth that getting to Iceland is long, hard, and with many obstacles. That is simply not true. It is only a four hour time difference from America’s East Coast! If this is the rationalization you are giving yourself for not going to this wonderland and you live in America, Central America, or Europe then you can no longer use that. Sorry to burst the bubble! After landing around 6am our first stop was in the airport at the Duty Free Shop. Booze is pricey in Iceland (especially craft beer.) It is a must to stop in this shop (where it will still be expensive to you) and to stock up. After that we took a shuttle to our friends at Happy Campers where we had a reservation for one of their Yellow Camper Vans for the week! I can’t say enough nice things about our experience with Happy Campers and highly recommend them. You can sleep in this van at campgrounds as you tour the country! Here’s a picture of the Ring Road below via the Iceland Travel site. We actually went south first and it’s one road around the whole country and named Road “1.” We drove the 850 some odd miles (plus plenty of extra miles on side trips off the Ring Road) in 7 days and 6 nights but it was a pretty intense pace. I would recommend 8-10 days/nights if you have the time. We saved the city of Reykjavik for the end of the trip and headed straight to the Golden Circle after a stop at Bonus to stock up on some hiking snacks/dude food. It’s hard to miss as there’s one right by the airport and the logo is a pink pig! The Golden Circle has three amazing destinations that you can hit in a day trip from the city. They are Thingvellier National Park, Geyser, and Gulfoss. We first hit Thingvellier National Park for about five miles of hiking and exploration. It included this beautiful waterfall and it’s the location of Iceland’s first parliament and it was located there from around 930 A.D. up through the 18th century. It is also where tectonic plates split causing a rift valley where most of the hiking trails exist. It’s a great place to get some miles in to cure any jet lag. 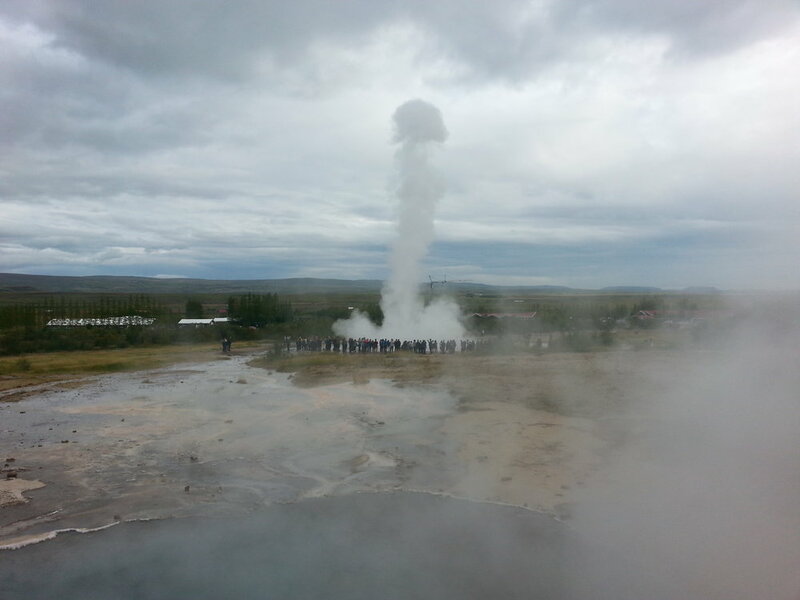 The second Golden Circle stop was the amazing to see but not mind blowing named destination area of Geysir. Which has you guessed it…geysers! Cool to see, plenty of parking, and definitely recommended to hike to the top of the hill like we did to watch one “blow off some steam” and stretch the legs. Waiting to watch an eruption! Strokkur explodes like this every 10 minutes or so. After about a 20,000 or so step day we had a short drive (after getting lost and realizing we should use Google Maps on our phone instead of a Garmin that didn’t work) to the Gesthus campsite. This was one of my favorite camping locations on the trip! Warm showers, stoves to cook a tasty breakfast of eggs/avocados/fruit, plenty of space as you can see in the pic below from other campers (even at full capacity space between each other was plenty), and a guest room that was awesome to converse with other travelers and play some cards/have some drinks! Our Happy Camper Van came with chairs, table, 10 gallon water fill up (you can fill at any hose at a Iceland gas station around the country and it's safe to drink), cooking gear, and a ton more. We had free drinking water all week and no plastic bottle environment destruction…which I am two thumbs up on! A few burgers and many beers were had and it was lights out by around 10ish. We didn’t really sleep the night before on the way over so it was welcomed! Day Two promised an early rise with an epic day of hiking. I’ll be back soon with the day two post! What do you think? Ready to head to Iceland? Been and excited to go back? Leave your comments below and thanks for being here! If you want to win a framed and signed Hashtag 59 Print from a place like Iceland sign up for our newsletter in the footer!